When I lived in NYC about 15 years ago, I took a fascinating course at The New School on New York City history from the rock formations to the Brooklyn Bridge. Each week, the professor, Joyce Gold, filled the hour with amazing stories and slideshows of historic buildings, some that still stood today, and others that remain only in antique paintings. In addition to the weekly lectures, a course requirement was to attend three of her public walking tours. (Click here for details on her current tours and courses.) She'd lead you through intriguing neighborhoods with her microphone and speaker, telling you details that, to most people, were long-forgotten. If you had a question, she'd know the answer immediately. In addition to the wealth of knowledge and appreciation on NYC history I got from taking the class, one of my greatest take-aways was to "look up." No matter where you go, whether it is a new city or the same route you have taken every day for the past ten years, you will always find something new and get a different perspective on things by simply looking up. 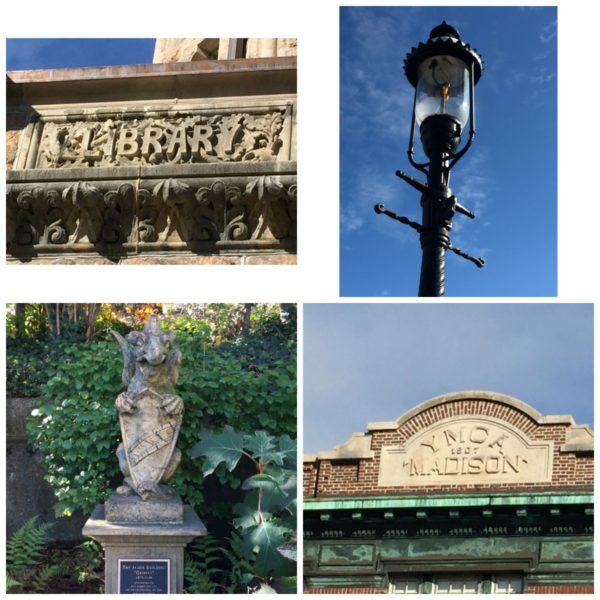 Signs, ornate facades, and unique architectural features are everywhere, but most of us take our route by looking down at the sidewalks or ahead at the next crosswalk. These days, sadly, we are often looking at our phones. We are missing a whole world of beauty that we would find if we just look up. "But I do look up," you might be saying. Ok. I challenge you to a little quiz. Most of us have walked miles around Madison, up and down Main Street and Waverly Place. I took a little stroll along Main and Waverly the other day, and snapped photos of a few places. See how many you can identify. No peeking (the photo answers are below). How many have you ever noticed before? I guarantee at least one will be brand new to you. (It was to me!) After the quiz, I hope that you will be more observant of the unique buildings in our town, and others, and will remember to look up. The Museum of Early Trades and Crafts was built as the original town library. The griffin sits on the garden by the train tracks. This is an original griffin from the James Building, across the street. 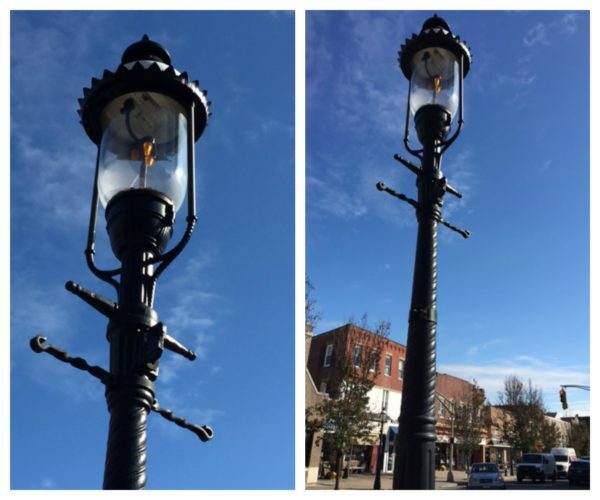 Have you ever noticed that almost all the lampposts downtown are these beautiful historic design? They also just installed some along Kings Road in front of the train station. Yup-- the original YMCA, built in 1907, is right across from the Museum of Early Trades and Crafts. I heard a rumor that the original basketball court is still in there. Wonder if that's true. The Burnet Building, on the corner of Main Street and Central Ave, home of Tons of Toys, among other businesses, was built in 1895! The James Building, the large orange stone building across from the original library (now the Museum of Early Trades and Crafts), was built as retail space to help fund the library. In the corner of the building, where Chatham Bookseller is now, was the location of the original Children's Room for the library. This beautiful circular window is also in the James Building, right above Short Stories. The Brittin Building, built in 1898, is now home to Healthy Italia, Club Pilates, and Carvel. 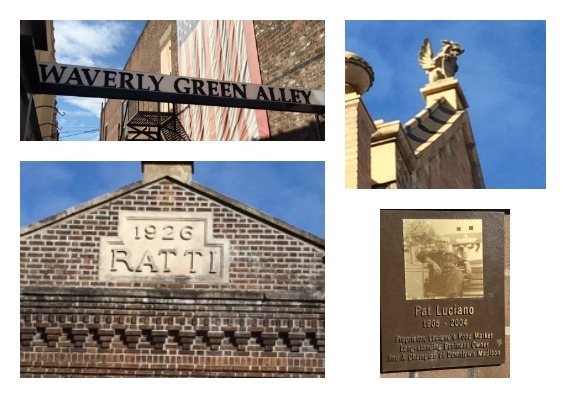 Did you know that the cut-through to the back parking lot next to Madison Wine Cellar is called "Waverly Green Alley"? Bonus point: What is the name of the alley across the street, next to Drip that leads to Rocco's and the parking lot? I'm not telling. You will need to check your answer yourself! I love this photo of the long-standing business owner that is on the wall outside Prima on Main Street. Can't you just hear him ringing up your groceries on the cash register? 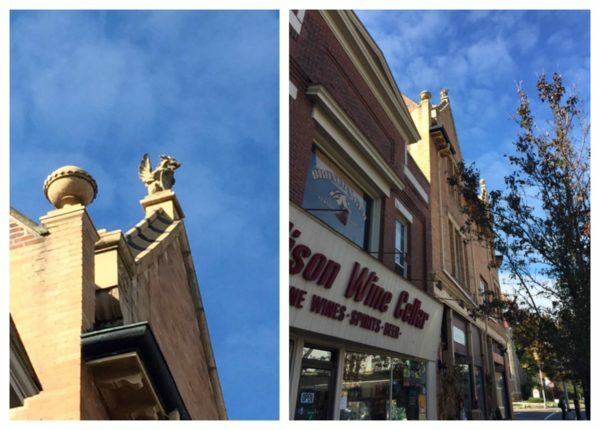 Have you even noticed these signs on the building where Crowley's Cupcakes and Cambridge Street Paper are? It was the Old Methodist Church in 1844! This one is the tricky one I warned you about earlier. If you got this one, I'm going to give you triple bonus points! Tucked up under the last awning of Rose City Jewelers/Gemologists is this crazy Rx sign. 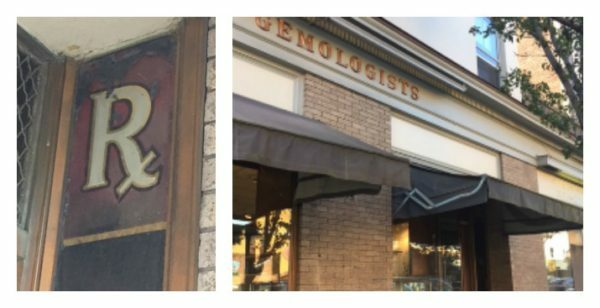 Curious, I stepped inside and asked the jeweler, Joseph Falco, Jr. if he knew the history of the building and if it had been a pharmacy. He had a wealth of amazing information, and has been very active in the Madison Historical Preservation Commission, including putting together a walking tour guide (and he gave me a copy!). 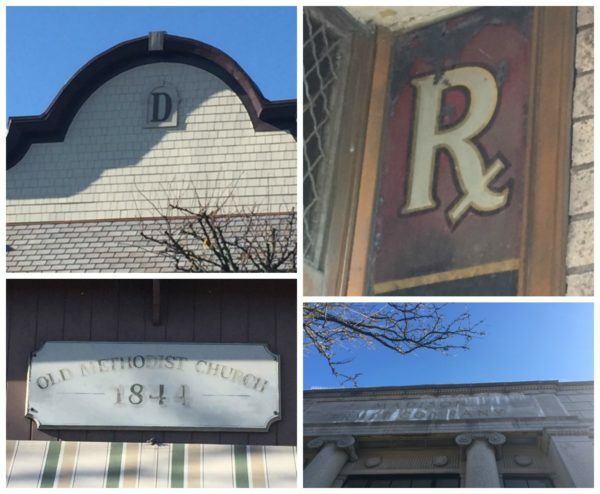 And, yes, the building was actually two different pharmacies over the years. So glad they preserved that Rx sign! What a find! 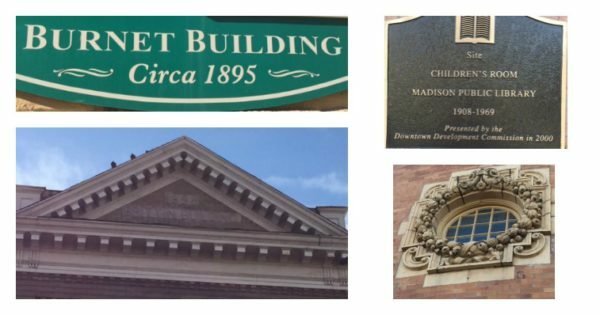 On your way to getting your hair cut at Downtown Salon or catching lunch at Blue Wazabi, look up to see that the building was originally Madison Trust Company. 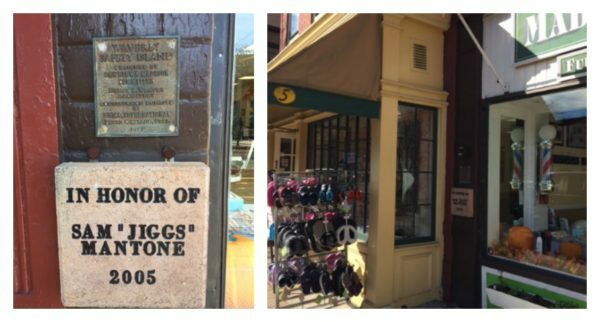 Next time you head into Suburban Shoes, take note of the plaque honoring long-time Madison businessman and resident, Sam "Jiggs" Mantone. Better head out to see this one quick before the next tenant moves in. When Statements moved from their location next to Rose City Jewelers to head across the street, this old sign was revealed. I think I can make out the last line as "Hair/Barbers" but I am not exactly sure. What do you think? Do you know what business used to be here? 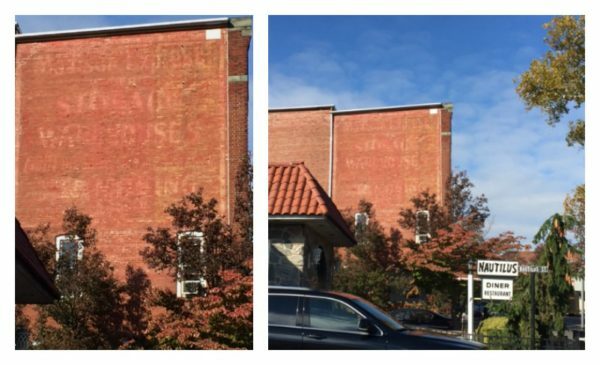 You've probably passed this brick wall next to Nautilus Diner almost every day, but have you even noticed the faded old sign that reads "Storage Warehouse"? This sign on the street lamp by the crosswalk at Main Street and Waverly Place honors M/Sgt William J. Keppel. There are dozens of similar signs honoring Madison veterans on street signs and lampposts throughout town. Recently I noticed one on the street sign at the end of my road. With Veteran's Day tomorrow (though we should honor our veterans every day), I feel I will end my tour here, with just a simple reminder that you will find new and interesting things by simply looking up.